"The great never occurs by accident, and never comes as a flash of fancy: it is the word that makes countless threads long pre-planned in history meet together. The great is a synthesis of the whole that, in its parts, had gleamed with a phosphoric light amongst the entire nation; it would have never become great unless it had met the creative yearning of the entire people."1. 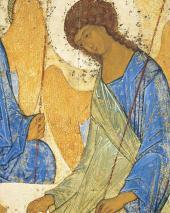 IN 1929, THE ZAGORSK HISTORY AND ART MUSEUM PASSED OVER THE MOST ACCLAIMED RUSSIAN ICON, THE "HOLY TRINITY" BY ANDREI RUBLEV, WHICH IS CONSIDERED THE ACME OF RUSSIAN NATIONAL ART, TO THE TRETYAKOV GALLERY; SINCE THEN THE ICON HAS BEEN KEPT UNDER THE CONSTANT ATTENTION OF ITS CURATORS AND RESTORERS. 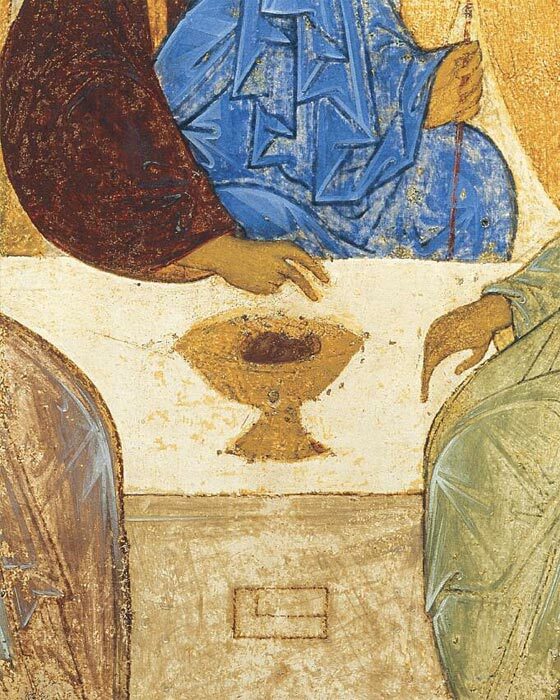 RUBLEV'S "HOLY TRINITY" HAS ATTRACTED THOUSANDS OF PEOPLE OF EVERY CREED, PROFESSION AND AGE WITH A COMMON DESIRE TO WORSHIP THIS IDEAL OF BEAUTY AND TRUE SPIRITUALITY, EXECUTED WITH PERFECT ARTISTIC MEANS. 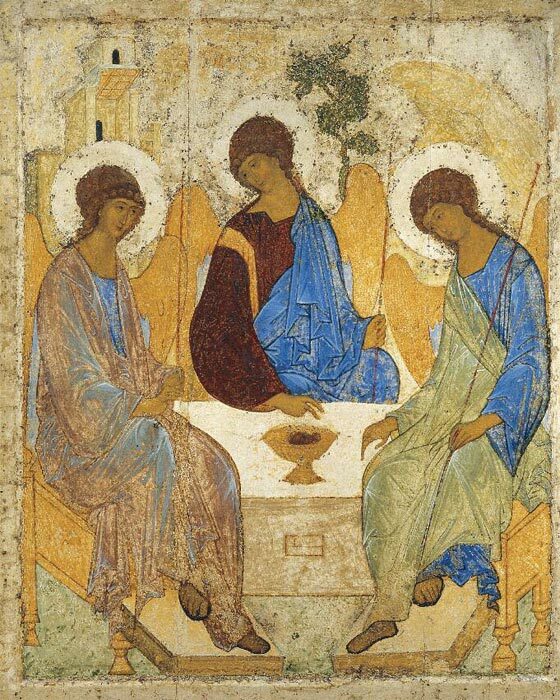 Any discussion about any work of art, whether secular or religious - all the more so when the subject is the "Holy Trinity" of Rublev -starts with certain questions: Where? (the locus), when? (the tempus), who? (the persona), why? (the causa activa), and what for? (the causa finalis). created.4 While the original, adorned with a gilt oklad (setting frame), richly enstudded with jewels on Boris Godunov's instruction in 1600,5 was moved to the place due to the principle icon of the cathedral (possibly following its glorification as miraculous) in 16266, the copy was placed to the left of the Holy Doors, next to the icon of the Mother of God (the Hodigitria). For about 500 years the original icon occupied its place in the Trinity Cathedral of the Monastery, and was restored more than once. Now we face the most complicated task of discovering the major reason - the causa finalis - for which the icon was painted, its goal, and its significance for the world in which we live. Any icon combines a dogmatic philosophy as well as an ethical and ideological exhortation and the artistic features of a painting. Any interpretation of the dogmatic sense of the Holy Trinity as it is realized in the iconographic tradition of the Old Testament Trinity image should start with a glance at the original biblical story. 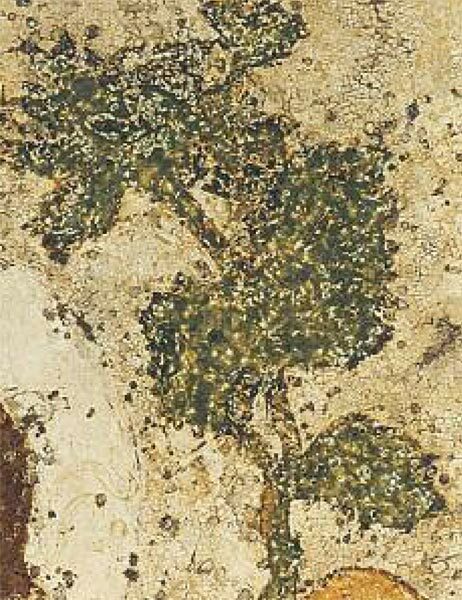 The 18th book of Genesis narrates the story of how the Lord appeared to Abraham in the plains of Mamre when he was sitting at his tent door. As he looked up and saw three men standing at a distance, Abraham ran to meet them, bowed and said: "My Lord, if now I have found favour in thy sight, pass not away ..." (Gen. 18.3) Further the Bible relates the meal Abraham and Sarah hastened to make and set before their guests. At the meal the Lord promised the couple, well stricken in age, the birth of a son, Isaac. At the end of the meal Abraham showed them the way to Sodom and Gomorrah. And on the way the Lord told Abraham the terrible fate that awaited the two towns, "because their sin is very grievous". As the men turned their faces away, Abraham approached the Lord with a plea to spare the inhabitants of the sinful cities on certain conditions. Then the Lord went away, and Abraham returned to his dwelling. 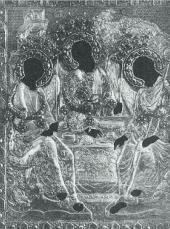 Nevertheless, it was the third of these interpretations that proved predominant in Russia, and its portrayal created the dogmatic Orthodox meaning of the "Holy Trinity" icon. Moreover, it was nothing else but that dogmatic dominant embodied, thanks to St. Sergius' deeds and St. Andrei Rublev's icons, in the Russian religious mentality and practice that saved Russia from the temptation of separating into a Uniate Church, and helped the Russian Orthodox Church to advocate its theological views in the debate about the doctrine of Filioque. The miniature image in the Oktoih (from the 11th-12th centuries) kept in the Vatican portrays the three Holy guests as wingless, with the figure in the centre wearing a cross-shaped nimbus. Moreover, the characters are not placed according to the principle of isocephalia, in other words, they are not presented in line, and have the same height, but make a half-circle. Such a depiction of characters became customary in the Eastern provinces, probably in Syria. 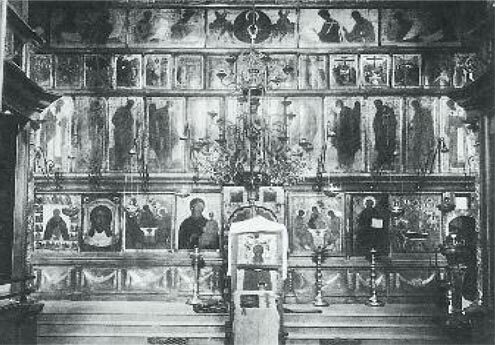 The isocephalic composition is more likely to pertain to the earlier period of Christian art and to its Western branch, for it conveys the equality of the characters, which agreed with the teachings of St. Augustine and other Holy Fathers of the Western Church.29 The Eastern Church, especially in the provinces, interpreted the subject differently and Orthodox iconography tended to see it as the appearance of God accompanied by two Angels, which, consequently, led to the traditional composition of the "Holy Trinity" generally accepted in Russia - although there were rare exceptions, like the Pskov "Old Testament Trinity". 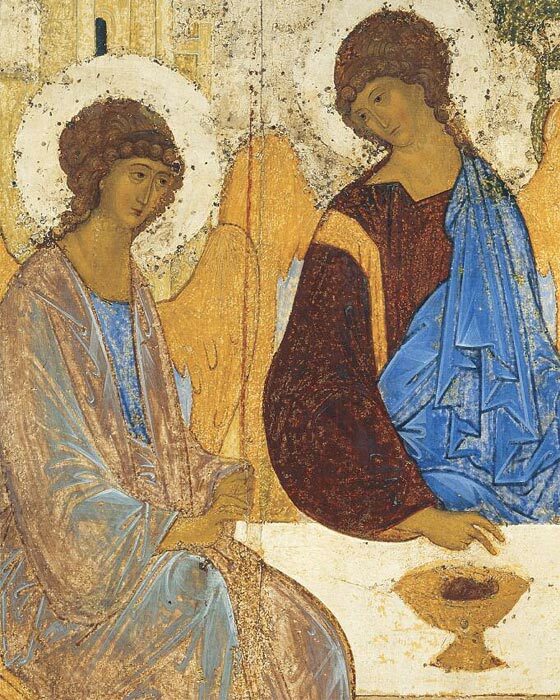 The round compositions of later periods reveal some details which testify to the fact that the icon-painters tended to portray more often the Three Persons of the Holy Trinity, than the appearance of Christ in the company of two Angels. 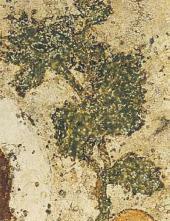 Thus, the fresco in Karakilis (from the 11th century) shows each of the three figures with a cross-shaped nimbus over their heads. Such nimbi can be found on the icon "Otechestvo [Fatherland]" (from the 16th century, in the Tretyakov Gallery). Further evolution of the "Holy Trinity" composition displays the idea of the triune Godhead - God the Father, God the Son and God the Holy Ghost -on a growing scale. The table, for instance, portrayed as semi-circular in the earlier icons, with the aim of focusing on the central figure of the Trinity, acquired, at the time of the Paleologues, a tendency to be depicted as rectangular, as there was a tendency to encircle the whole composition and to give the images of the Angels the same height. Such was the historical background in which Andrei Rublev created the icon of the "Holy Trinity". Florensky wrote: "We melt with reverence, we are amazed at and almost stung by neither the subject of Rublev's oeuvre, nor the epitome of the Three or the Cup on the table, nor the wings, but by the veil of the noumenal world suddenly switched off ... Among the rapidly changing circumstances of the time, among quarrels and feuding, general barbarism and Tartar depredations, among that profound non-peace . your mind's eye sees the indisturbable, inviolable peace, the 'Godly peace' of heaven. The antagonism and hatred which reign on earth are set against a mutual love flowing in perpetual agreement, in a perpetual silent conversation, in the perpetual unity of heaven. "33 There comes the conclusion that the "Holy Trinity" was, on the one hand, the result of the spiritual and historic progress of the Russian people, and encouraged them on the way to a new spiritual and historic endeavour, such as national unity and mutual love; and a preference for heavenly values over earthly ones, on the other hand. The developments of the 14th century made it obvious that the future Russian state would be multi-national, as was seen in the deeds of St. Stephan of Perm who worked to educate the Zyryan people. As peoples never come to live together unless they have some common interest, it forms the common memory and common tradition of the past without which a nation cannot exist. But memory is not all: a viable nation must have a general programme and general idea for its future. The ethical and ideological significance of Andrei Rublev's oeuvre is that the image of the "Holy Trinity" managed to blend the past and present spiritual experience of the people and its future which made up the fundamental idea of the nation-state. When Rublev was canonized in 1988, the Russian Orthodox Church confirmed that great significance of the "Holy Trinity" for Russia as well as for the whole Orthodox world in the iconographic image of St. Andrei Rublev holding the "Holy Trinity" in his hands, and in the words of his Troparion (Saint's day anthem). 1 Florensky, Pavel. Collection of works, vol. 2. Moscow, 1996, p.360. 2 see: Golubinsky, Yevgeny. "Prepodobny sergei Radonezhsky and sozdannaya im Troitskaya Lavra" [Reverend Sergius of Radonezh and the Trinity Lavra that He Created], Moscow, 1909, p.185. This oeuvre features the Trinity Cathedral iconostasis. 3 See: Antonova, Valentina. 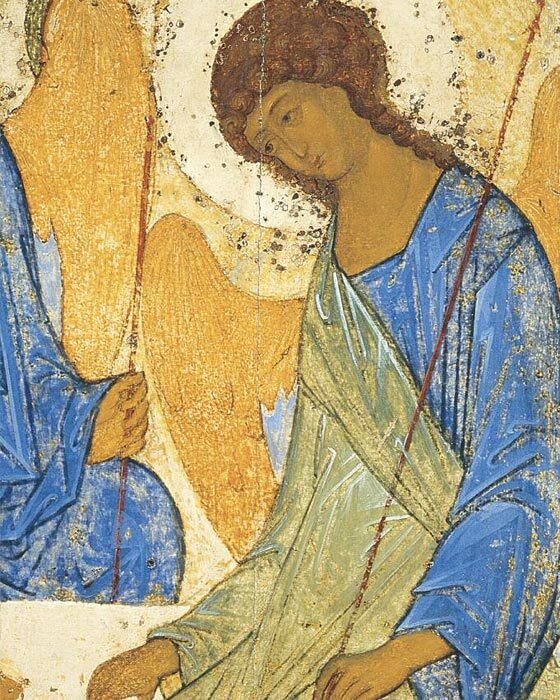 "O pervonachalnom meste Troitsy' Andreya Rubleva [On the initial position of "The Holy Trinity" by Andrei Rublev]. The Tretyakov Gallery Materials and Research. Issue 1. Moscow, 1956. 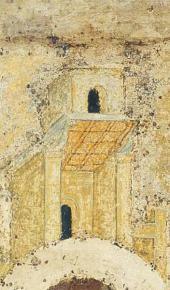 According to Antonova, it was, probably, indicated by the words: "в похвалу... Сергию чудотворцу" [to the praise... of Sergius the Wonderworker]. The extract the words have been taken from belongs to the Stroganov Iconographic Original (late 16th century). Its text can be translated as follows: "Reverend Father Andrei of Radonezh, the icon-painter named Rublev who painted many holy icons, all of them miraculous . had earlier lived in obedience with Reverend Father Nikon of Radonezh. He ordered an image for the Holy Trinity to be painted in his time, to venerate His Holy Father, St. Sergius the Wonderworker..." (See also: Buslayev, Fyodor. "Istoricheskiye ocherki russkoi narodnoi slovesnosti i iskusstva" [Historical Essays of the Russian Folk Literature and Art], vol. 2. Moscow, 1861, pp.379 -380). Some researchers refer to the town of Klintsov of the former Novgorod-Seversk vicariate where the ancient manuscript was found. It was much later that it became the property of Count Stroganov. The manuscript enabled writing "The life of St. Nikon of Radonezh" published in 1786. The manuscript also contained the Iconographic Original. 4 See: Guryanov, Vasily. "Dve mestnye ikony Svyatoi Troitsy v Troitskom sobore Svyato-Troit-skoi Sergiyevoi Lavry i ikh restavratsiya" [Two Local Icons of the Holy Trinity in the Trinity Cathedral of the Holy Trinity-St. Sergius Lavra and their Restoration]. Moscow, 1906, p.5. 5 See: Kondakov, Nikodim. "Russkiye klady. Issledovaniye drevnostei velikoknyazheskogo peri-oda" [Russian Buried Treasures. Research of the Antiques of the Time of the Grand Principalities], vol. 1. Moscow, 1896, p. 175. 6 See: Golubinsky, op. cit., see note 2, pp. 185 -186. True, it was as early as 1641 that the icon was referred to as "miraculous". 7 See: Guryanov, op.cit., see note 4, table 1 and fig. 2. 8 The cleaning was made by Grigory Chirikov (of faces), Ivan Suslov, Yevgeny Bryagin and Vladimir Tyulin. In 1926, Bryagin made the final uncovering of later layers of paint and restoration colouring. See: Dictionary of Russian icon-painters of the 11th-17th centuries. Moscow: Indrik, 2003, p. 543. 9 Olsufiev, Yury. "Opis ikon Troitse-Sergiyevoi Lavry" [Inventory of the Icons of the Holy Trin-ity-St. Sergius Lavra]. Sergiyev, 1920, pp. 15, 25. 10 See: Dictionary, op. cit., see note 8, p.544. 12 See: "Sobraniye mnenii i otzyvov Filareta, mitropolita Moskovskogo i Kolomenskogo, po uchebnym i tserkovno-gosudarstvennym voprosam" [Collection of Accounts and Reviews by Philaret, Metropolitan of Moscow and Kolomna, on the Matters of Education, Church and the State]. St Petersburg, 1887, accessory vol., p. 331-342. 15 Florensky, Pavel. op. cit., note 1, pp. 362 - 364. 16 St. John of Damascus. "Tri zashchititelnykh slova protiv poritsayushchikh svyatyie ikony ili izobrazheniya" [Three Apologies against Those who Decry Holy Images]. St Petersburg, 1893, p. 8. 18 Archbishop Sergius. 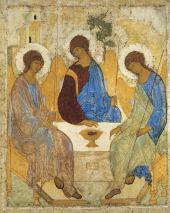 "Bogoslovskiye idyei v tvorchestve Andreya Rubleva" [Theological Ideas in Andrei Rublev's Oeuvres] in "Theological Oeuvres", No. 22, Moscow, 1981, p. 5. 19 Such research was made in "Troitsa' ili 'Pyatidesyat-nitsa'?" by Nikolai Ozolin in: "Philosophy of Russian Religious Art", issue 1, Moscow, 1993, pp. 375-384. 20 Procopius of Gaza (6th century), for example, alleges the existence of the following three parallel accounts: "As for the three men who appeared to Abraham," he writes, "there are some who assert that they were three Angels; others think that one of them was God while the others were His Angels; and other ones see the prototype of the Holy and Co-essential Trinity" in: Procopius of Gaza, vol. 87, p. 363 (PG, t. 87, 363). 21 Priest A. Lebedev. "Vetkho-zavetnoiye veroucheniye vo vremena patriarkhov" [The Old Testament Beliefs at the Time of the Patriarchs], issue 2. St Petersburg, 1886, p. 122. 23 Florovsky, George. "Puti russkogo bogosloviya" [Ways of Russian Theology]. Paris, 1937, p. 508. 24 St. John of Damascus, op. cit., note 16, p. 127. 25 John of Damascus, op cit., see note 16, p. 127. 26 "Troitse-Sergiyeva Lavra" [The Holy Trinity-St. Sergius Lavra]. Collection of articles. Sergiyev Posad, 1919, p. 127. 27 See: Ainalov, Dmitry. "Mozaiki IV i V vekov" [Mosaics of the 4th and 5th Centuries]. St Petersburg, 1895, p. 112. 29 See: Malitsky, Nikolai. "K istorii kompozitsii vetkhozavetnoi Troitsy" [On the History of the Old Testament "Trinity" Composition]. Prague, 1928, pp. 34-36. 30 The Life of Saint Reverend Andrei Rublev. In: "Canonization of the Saints". 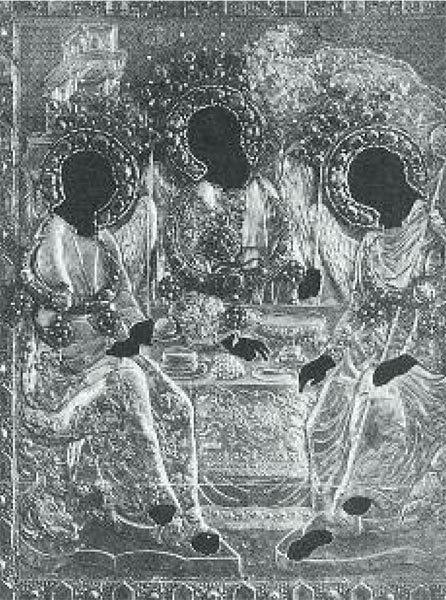 Troitse-Sergeiyeva Lavra, 1988, p. 58. 32Archbishop Sergius, op. cit., see note 18, p.9.